This Knight is part of the Dragon story I released last year. You can get the story links and see the dragon here. 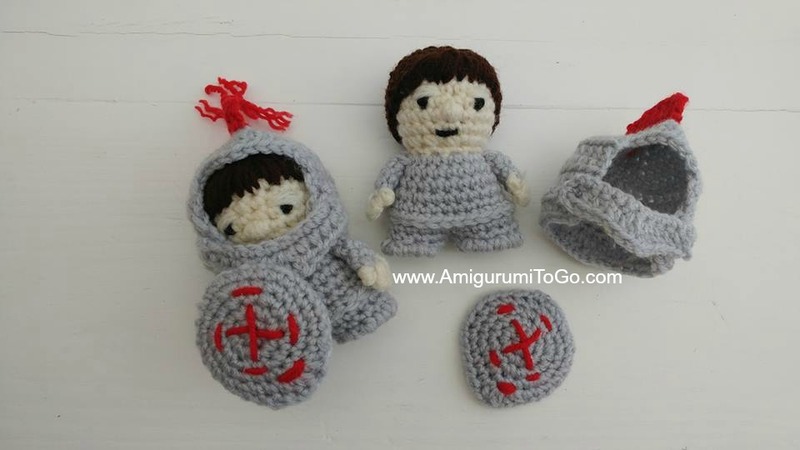 The only piece not included in this pattern is the sword. The sword instructions are found in part two. If there are parts you find difficult to understand just do the parts you can, a video is on the way. ALSO keep in mind I have not thoroughly tested this pattern so if there are any mistakes do not hesitate to leave a comment and let me know. I'll be so grateful if you tell me. 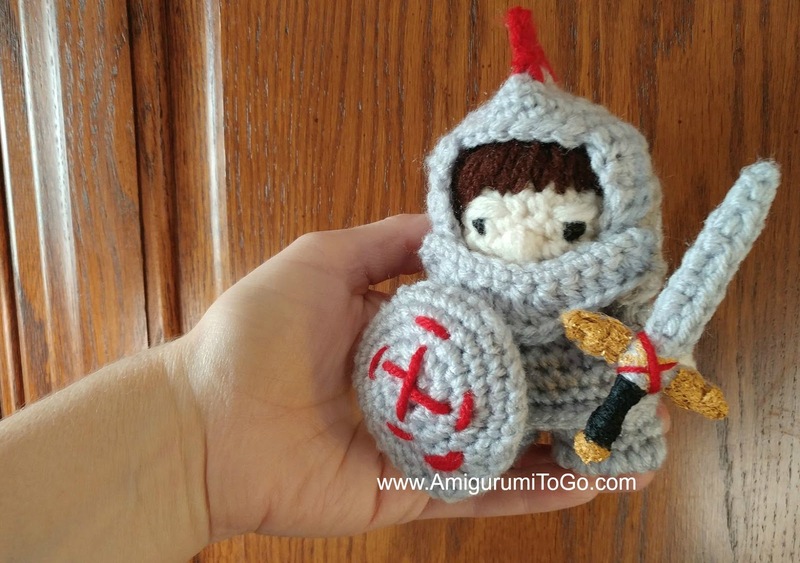 Scroll down this page for the Little Boy Knight, his helmet and shield. Have fun! Turn the doll upside down and roll back row 16 to expose the loops inside the body. Look for the area where you f/o row 16 with a sl st, insert yarn into a loop or 2 to the right of that sl st.
Now you will create the leg holes. If you have installed safety eyes then you need to 1sc in the next few st until you get centered with the eyes. Your last st should be in the center of the eyes. Continue now with the legs, the pictures are numbered according to each step from 1-5. Step 1) 1sc into the 13th st from the hook. 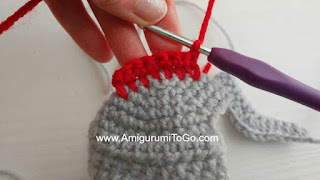 Step 3) Insert your hook through the 2 stitches that are the closet to the first leg. 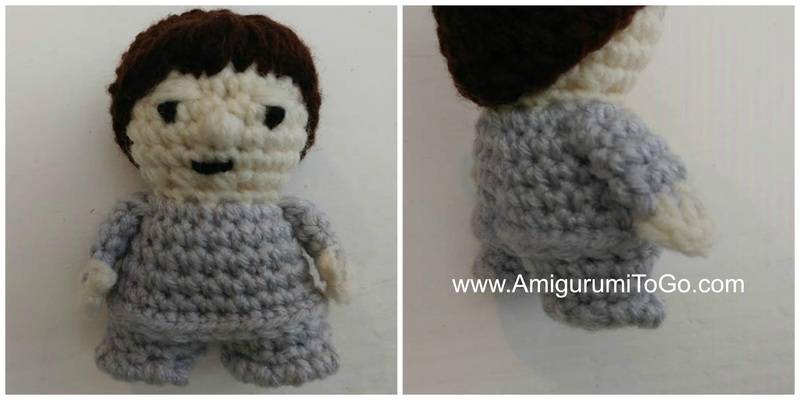 Step 5) turn the doll so the front side now faces you and the first leg now to your right. 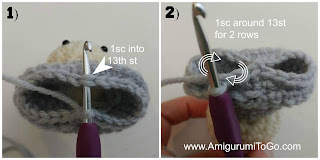 Step 6) As pictured with the arrow, starting in the first st to your left, pull the starting yarn tail tight, (crocheting around the starting yarn tail to lock it in), 1sc in 13st for 2 rows. f/o and tuck yarn tail inside leg. Stuff the body, shape as you stuff, stuff to the edge of the leg holes. If it's too difficult to keep the stuffing inside the leg, leave that part of the stuffing until you have the shoes partly sewn in place. sl st next st and f/o leaving a long tail for sewing and shaping. Step 1: Place the wrong side of a shoe inside a leg hole, line up the stitches with the stitches of the leg, whip stitch around. Your needle should be going under the 2 loops of a stitch on the shoe and 2 loops of the stitch on the leg, each time you go through. Leave a small gap for stuffing if needed then use a stuffing stick to push the stuffing in. Do not over stuff, you want the bottom of the shoe to be flat when you're done. When you make it around to where you started continue with step 2. Step 2: To create the front of the shoe, wrap the yarn 5 times into one space then 5 times again in the next space and again in the next, around the front part of the shoe. 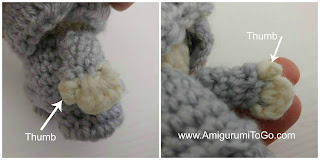 Doing this creates a fat ridge which gives it shape and it will help the doll stand. Wrap the yarn in one direction. It doesn't matter if you wrap from top to bottom or from bottom to top but do the same direction for both shoes, otherwise they will look slightly different from each other. Once done, knot off and hide remaining yarn tail inside the leg. 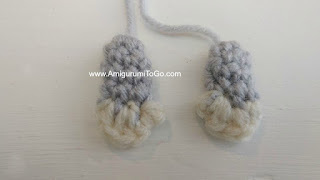 Thumbs: Wrap the yarn tail over a small section on one side of the hand and pull tight to create a separation in the hand. The small bump on one side of the separation is the thumb. When you sew the arms to the body be sure the thumbs are facing each other. The hands will have a slightly different look from each other but they are small so that's barely noticeable. Flatten the helmet so that the open front sides line up. you can get creative with the 3rd row, For a couple of them I only used 3st then f/o. To use all the stitches follow row 3.
f/o. 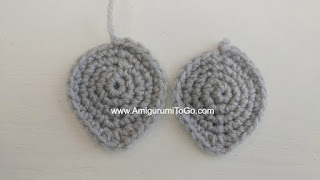 You could weave in the yarn tail or add a few strands to decorate this part further. 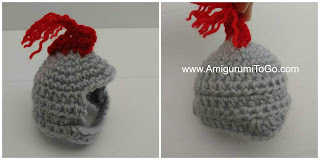 Place the helmet on the head, be sure to pull the bottom of the 2 front edges in towards the face. Place the face plate over the face, take note on where the ends are sitting on the helmet, remove the helmet and sew each side to the helmet. 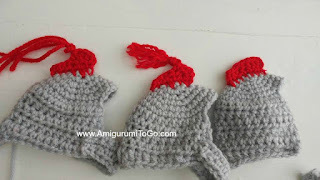 Weave in yarn tails. 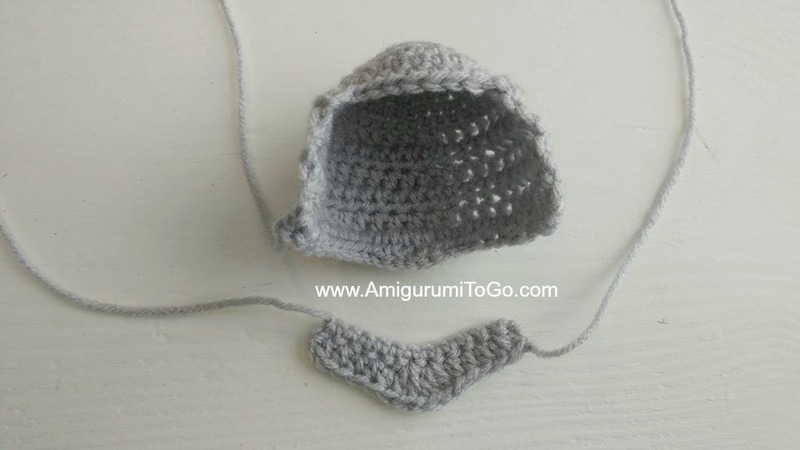 Pull the starting yarn tail tight to close up any center gap. Decorate the right side of one shield piece. If you like the decoration I made then using red yarn make an X then add a short red line in front of each point of the X. Add 2 short red lines just above the sharper tip of the shield. Once done, knot the yarn tails and cut short. Place the wrong sides of the shield pieces together, making sure the pieces are lined up, then whip stitch around the edges. Knot off at the end and hide yarn tail inside shield. Push a bobby pin from the front to the back. The bobby pin will hold up the shield for display. 1) Yarn eyes and mouth: Bring black yarn through the top of the head and out in between the 6th and 7th row, wrap the yarn around the 6th row 2 or 3 times. 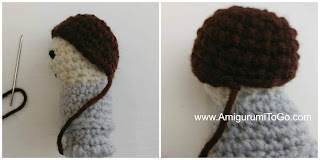 Bring the yarn to the other side to make the other eye with 3 visible stitch holes between the eyes. Once done the eyes, bring the yarn in between the 8th and 9th row to make the mouth. Once done, bring the yarn back up through the head and out one stitch over from where you went in. 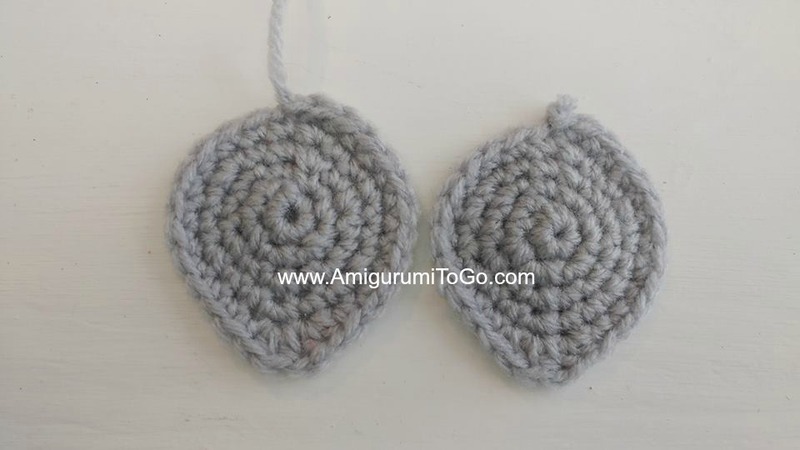 Knot the yarn tails together and cut short. 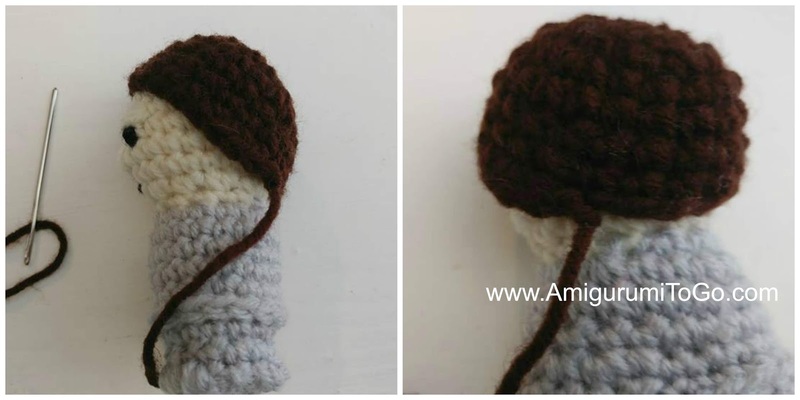 3) Sew on the hair cap: First stretch out the cap so it fits easier on the head. Place it so the bottom of the back of the cap sits on row 10 of the head. You can whip stitch "hair strands" around the entire edge of the cap or do as I did and just add the bangs in the front, the part you see through the helmet. If you add only bangs, do add a few holding stitches in the back and sides of the cap to keep it held in place first. 3a) Bangs: wrap the yarn over the front of the cap, you can make long or short wraps, over and over again along the front, wrapping into the head just above the eyes. Do not pull tight or you will see holes in the head when you're done. Pull just enough to bring the yarn into place.Once done, knot off anywhere on the cap and hide yarn tail inside head. 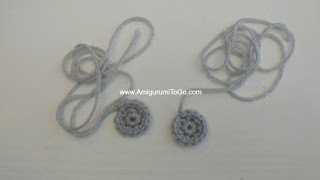 4) Sew on the arms. The top of the arm should be on or about row 11, the first grey row of the body. 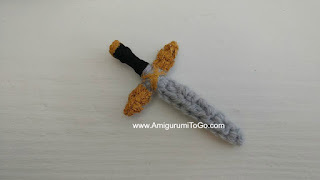 To make the sword, go to part 2! The Knight is almost ready for battle, he just needs his sword. That part is right here. 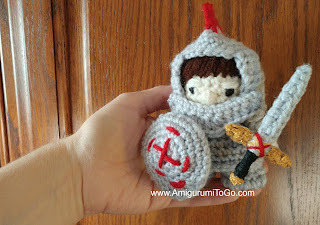 Love the little knight but not sure what I'm doing wrong. When I get to the end of row 9 I have more than 11 stitches. Is row 9 correct?